While wall mounted fans and ceiling fans are good options for saving space in outdoors, they are always limited by the need for a structure to mount them. Outdoor standing fans, on the other hand, may occupy a bit more room but are independent and include certain height by themselves, without the need of an external mounting piece. This kind of fans is ideal for patios, decks and any space where you need to ventilate and don’t have the option of mounting a permanent fan. Also, they have the advantage that you can periodically move them according to where you need the refreshment. Some of them even have misting devices which make them really useful for hot weathers and exteriors. This outdoor standing fan is one of the most basic models, while still offering a decorative feature. In a very versatile white color and classical upper style, with a pedestal that resembles antique Victorian lamps, this friend will adapt to any ambiance but it’s perfect for small yards and patios. Not the most powerful option so, if you’re looking for an outdoor fan for big patios or barbecue yards, maybe this is not your option. Nevertheless, it includes 3 airflow speeds that would work perfectly for small spaces. The adjustable neck can go from 40” to 51”. Fairly powerful for a small patio, deck, porch or for interiors with 3 speeds. While it says it’s wet rated and the painting is covered with all-weather UV paint, it’s not recommendable to leave it under inclement weather. It may be too heavy for moving it constantly. Materials are not the best quality. Not as powerful as one would expect for an outdoor fan. A considerably more powerful unit than the previous model, this outdoor standing fan is constructed in a durable structure to endure exposition to the outside. Nevertheless (and even when it’s a misting fan) you can’t trust to leave it under humid conditions or rain as it’s not wet-rated. As it is light enough you can take it in and out without inconvenient and it covers a wider space for patios and yards, around 500 ft sq. Misting function included for a more cooling effect. Adjustable height and tilting head for directing the air as desired. Oscillating function for a wider air/mist distribution. While its slim figure makes it easy to move, the head is considerably big and it may fall if there’s a sudden strong breeze. The misting function may get you soaked if not properly adjusted. While being stronger than the previous model, the airflow still leaves too much to be desired for an outdoors fan. Considerably pricey compared with other tower fans; this Lasko outdoor tower fan is without a doubt a piece of art. 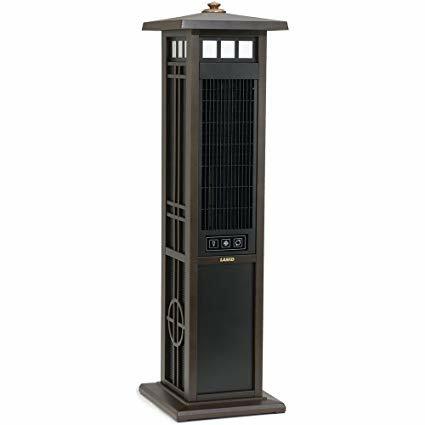 Covered in a Japanese-style tower which is incredibly beautiful and decorative, this unit is designed to endure outside weather, which is something not many outdoor tower fans can do. Ideal for thematic rooms, patios, yards, this product has an internal oscillation that will blow the air out of its holed walls in a so-quiet way that it will resemble a piece of furniture instead of a fan. This makes it great for indoor use also. All day timer option will shut the fan off when it’s been working for 14 hours. 3 quiet speeds for adjusting the air. Dimmable light at the top of the tower. Engineered for all weathers including humid spaces. Users have reported that even with the oscillating function, airflow is not very powerful on the sides. It comes with no instructions. 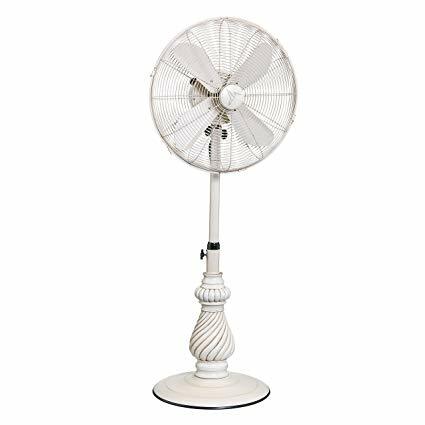 This outdoor pedestal fan highlights for its easy use and assembly; simply put it together without the need of any tools. While it’s not very decorative, it’s well-made and presents a very potent airflow for both big rooms and intermediate outdoor spaces. Lightweight and portable, you can carry this Lasko fan around with you to cool down any area of your house. Sadly, it’s not so quiet, but it won’t be so loud that it will interrupt a conversation on your patio. Programmable timer for 1, 2 or 4 hours. Assembles with no need of tools at all. Tilt head allows directing the airflow. Considerably noisy, not ideal for bedrooms. May fall if a sudden strong breeze comes up in outdoors. Plastic parts are not so durable. 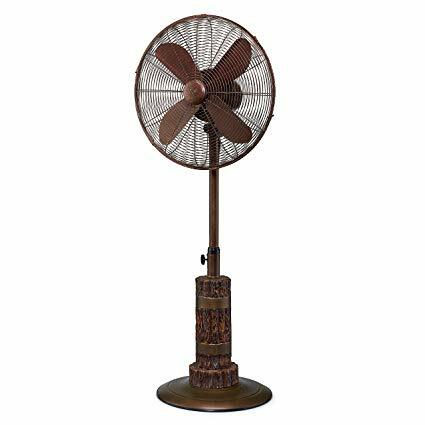 This Hunter outdoor pedestal fan may be called instead, a functional piece of decoration. While the fan is functional and powerful enough to cool down small-medium yards or patios, the structure is what makes this fan really remarkable. 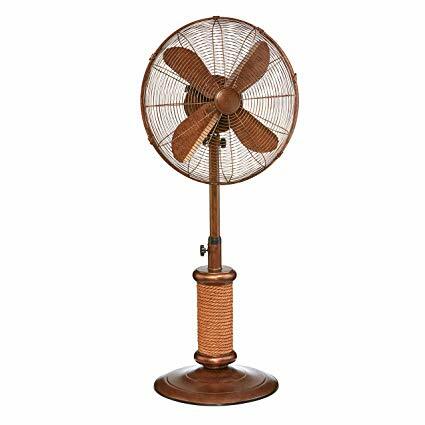 Not only it’s a beautiful outdoor pedestal fan but also well-made with quality materials and a weighted base that avoids vibration or falling even with hard breezes. It’s designed for exteriors so it’s not as quiet as an inside fan but the slow and medium speeds are fairly quiet. Hunter motor with three fairly potent speeds. Heavy base allows keeping it outside without risk of falling. Tilting head and height adjustable up to 58”. Fast speed is considerably noisy but not so much it’s unbearable on outside spaces. Outdoor deck fan, not for indoors. The heavy base is convenient if you plan to leave it in one place, but inconvenient if you want to move it. Outdoor standing fans are not all the same thing; some of them, while enduring heavy weathers such as extreme sun and humidity, not necessarily can resist water. That would be a problem if you lived in a rainy place, as you would need to constantly take the fan in and out according to the rain. On the other hand, if you’re planning on putting the fan on a pergola, marina or poolside, it’s definitely indispensable to own an outdoor standing fan waterproof, as the priority would be to avoid the damage due to the water contact and even most importantly, the risk of shock. 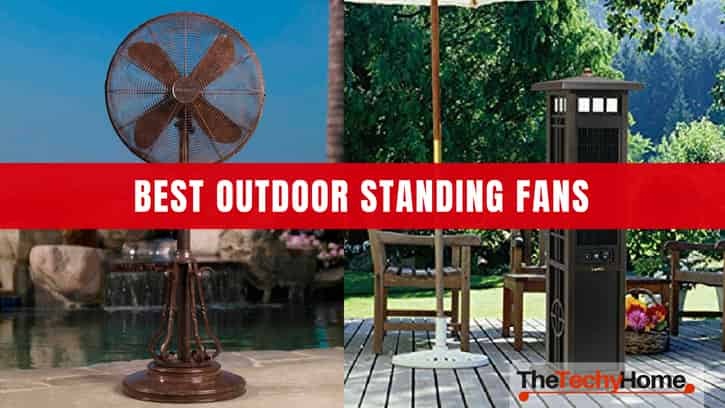 If this is what you’re looking for, then keep reading this list of outdoor standing fans waterproof or wet listed/rated for your top comfort and safety. 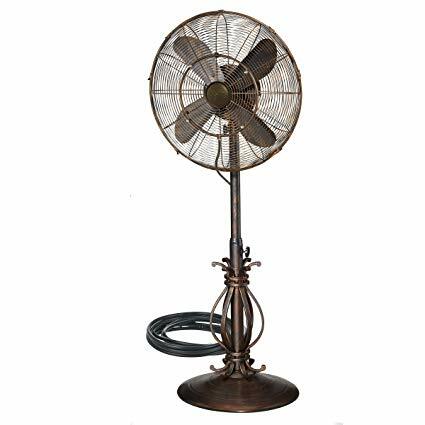 Ideal for humid/breezy weathers, this outdoor pedestal fan is weighted for more stability and also pretty decorative. Would be the perfect addition to any pool yard where kids are running and splashing water, as it would prevent the risk of shock and also the risk of hurting any kid if falling. Not perfect for too much rain, though, as it may support casual splash but rust with constant heavy wetting. Besides, its UV painting also protects it from sunny conditions so you won’t have any inconvenient if leaving it outside all the time. Black and with a sober decorative design is ideal for combining with any ambiance and décor. Very powerful it will cool down any medium space without a problem. All-weather designed even though it may get rusted if constantly exposed to rain. Not so waterproof even though it’s wet-rated. Can get rusted with constant rain. Due to its strong 3 speeds and considerable noise, it’s not ideal for interiors. It may vibrate a bit too much. 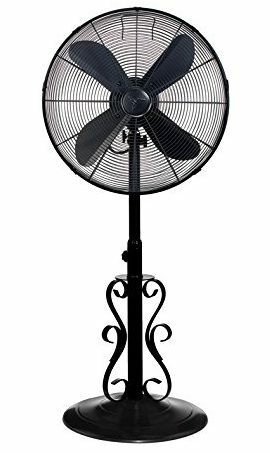 An outdoor standing fan, that can also be used for indoor rooms such as living rooms or other rooms that don’t require quiet refreshment. 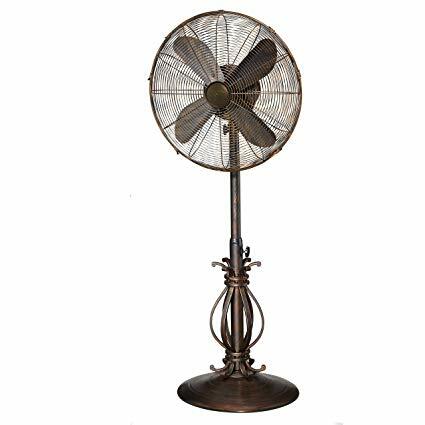 Very potent even in the lowest speed, this antique looking outdoor fan will cool down any outdoor space and as it’s designed for all weather, it can endure even some occasional rain without rusting. Its decorative shape and finish make it the perfect outdoor pedestal fan for combining with any thematic patios or yards. Oscillating function and tilting head allow distributing the air however you want. Adaptable neck allows adjusting the height up to 51”. All-weather, UV protected paint allows it for standing outside all-day-long. Weighted base makes it perfect for enduring hard breezes. Wet-listed and finish make it endure the moderate rain. Too loud for small indoor rooms would function only for open livings. 3 powerful speeds leave no room for a soft breeze. Very similar to the previous model in characteristics and potency, what’s very remarkable of this outdoor standing fan is its beautiful design. It’s perfect for woody decorations in yards, patios, and any outside space as it very heavy woody-style base will endure heavy breezes as well as add a “lumberjack” touch to any décor. 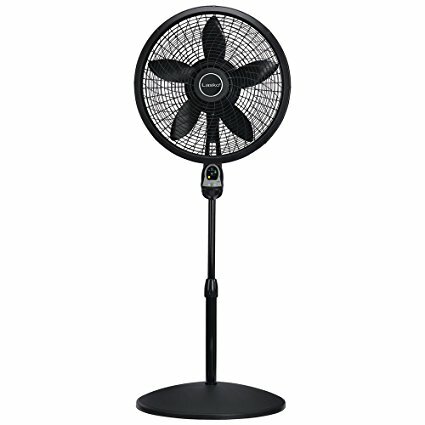 Very potent in any of its 3 speeds, it’s mostly for outside due to the noise it produces, but if you own a big open-living room where the noise won’t be a bother, this fan will keep the perfect temperature. Weighted base makes it perfect for enduring really hard breezes without moving. Wet-listed and finish make it endure high humidity, foggy weathers, and rain. Too noisy for indoors or small rooms. Really heavy and not portable for constant moving. Not-so-easy to assemble as the previous model. This Nautica model is so beautiful that it will be a great addition as an outdoor deck fan or for any pergola, marina, beach house and anything that has something to do with the ocean. Luckily it’s also really well covered, painted and protected to endure the salty humid weather of any of these places. Also, it endures rain pretty well and the weighted base will make it very stable even under heavy breezes. All-weather, UV protected paint allows it for standing outside all year round. Wet-listed and finish make it endure rainy, salty, foggy weathers thanks to its stainless steel structure. It’s fairly quiet so you can even use it in medium indoor rooms. Really heavy, not ideal for constant moving. The faux rope wrapping might get damaged by weather and time. The ideal outdoor standing fan waterproof, this unit has it all when it comes to functionality and good design. Unlike the previous model, it’s really stable while not being so heavy that you can’t move it around constantly. It includes a misting kit so you can feel relieved from even the hottest temperatures and its all-weather UV waterproof painting will keep it good as new all year round. Simply connect the garden hose and you’ll get refreshed instantly with no effort. Very little effort to assemble it, make it function and move it. Completely designed for enduring inclement weather with CFGI plug and non-fading resistant paint, as well as a stainless steel structure. May leak a bit if not well adjusted.